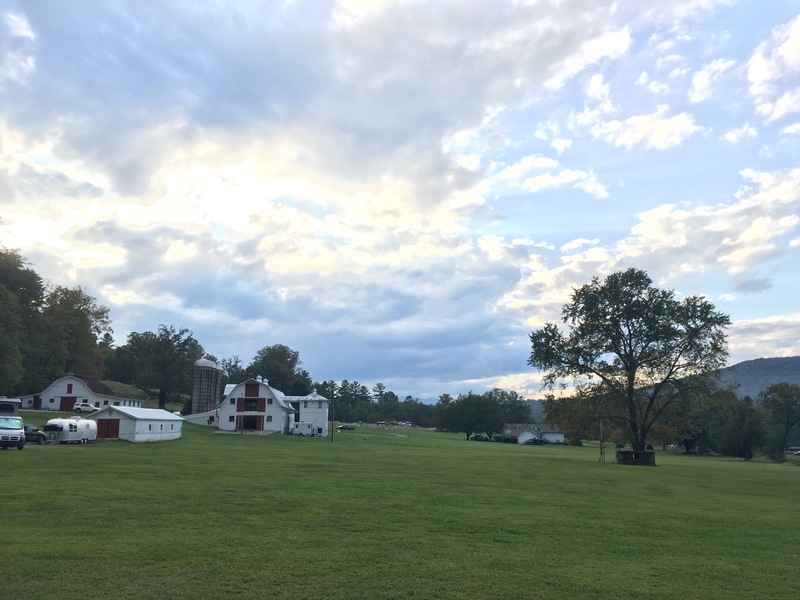 The House on the Hill Blog – Page 5 – Renovating a house from the 70s in the South. Finally Friday! I feel like parts of this week have just dragged by while others have flown and I’m so ready for the weekend. It’s going to be another super busy one so I’m sure it won’t be long enough but weekends rarely are anyway regardless of how much we have going on. 1 – Today is our 5 year wedding anniversary! Some of the high points over the last five years: adopting our 2 dogs, buying our first house, tearing apart half of that house, putting less than half of it back together, 2 amazing cruises, tons of great memories with family and friends, and expecting our first child. It’s been the best five years and we’re excited for what’s to come. 2 – I’m probably jinxing this, but I think the weather might finally be starting to turn. After this weekend it looks like we’re clear of the 80-whatever degree weather and I’m so freaking ready. Boots and flannel on standby! 3 – I have been dragging out decorating for Halloween this year which is unlike me. Most of our decorations are out but we’re still missing a few key elements in our yard which we need to put out this weekend. We added a couple of new things this year though and they are so cool! I bought a holiday projector from Home Depot during their Christmas in July sale a few months back and I’m a little bit obsessed with it. It came pre-loaded with a bunch of different Halloween and Christmas videos but you can also load up your own. A few of the Halloween options kind of freak me out so we’ve been sticking with the least scary ones. You just set up the provided screen on your window (or wherever you want it) and play whichever scene you want (or you can load multiple scenes and they’ll cycle through). 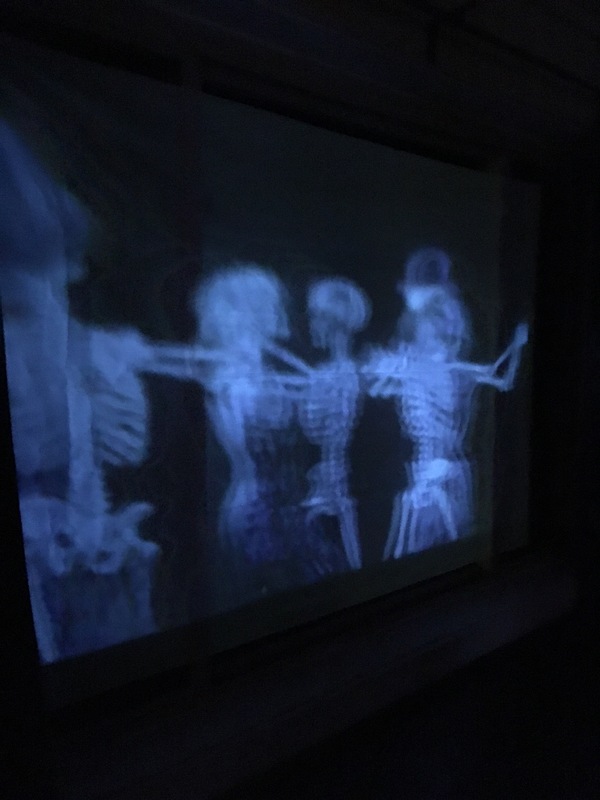 I don’t have a great picture but here’s a blurry take of my favorite: dancing skeletons. We picked up that witch for a steal from Home Depot last year the day after Halloween! We also just ordered more skulls to put throughout the pumpkins and they should be delivered today. 4 – Last night was the first night this week that we didn’t work in the nursery. We did get the dresser moved upstairs though with the help of our friend Nick (thanks again!) so it’s ready to be refinished. We decided to refinish it in the room instead of fighting humidity and sawdust in the garage or cat/dog fur everywhere else in the house. The dresser is the biggest thing on the list for this week for the One Room Challenge so hopefully it goes smoothly. I was planning on tackling it with lots of fans, open windows, and a mask but after checking out the VOC levels this morning, it looks like Kyle is going to have to manage this one. 5 – Speaking of the dresser, I ordered the prettiest Rifle Paper Co. paper to replace the drawers liners. I mean, c’mon! I already know I didn’t order enough so I need to figure out how much more I’ll need. The only other thing I have to figure out is how to make up the difference between the size of the paper and the size of the drawers. The paper is only sold in one size and it’s just a little short width wise but I don’t want that to keep me from using it so I’ll need to get creative. 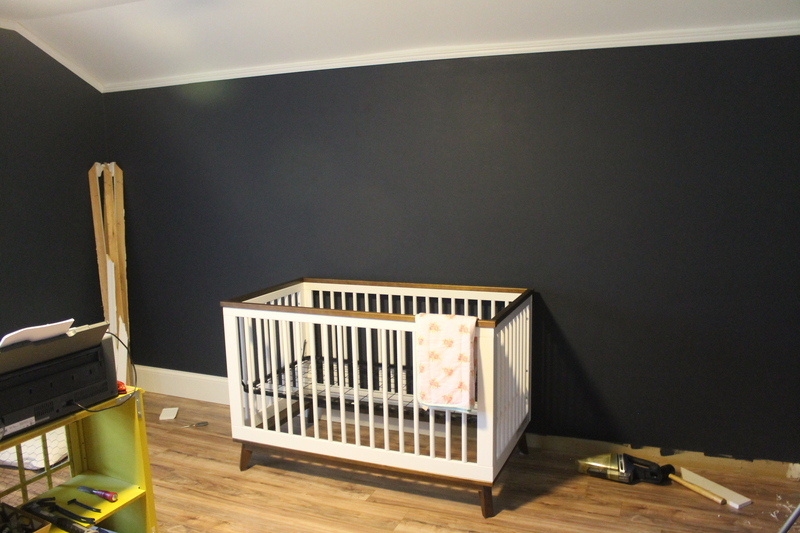 Time for my weekly progress update on our nursery for the One Room Challenge! For a little back story, check out last week’s post here. Y’all, I am super happy with how much we got done! And guess what? We got it all done! Well, we weren’t able to finish installing the baseboard but that’s because we were short two pieces and I had to order more. Whoops, my bad. It should be here today and won’t take long to finish installing! Not only did we finish all of that but we were also able to get a jump start on next week’s to-do list. We put together the crib and glider, installed the new door and closet trim, and put in the new fan. We went with this one from Home Depot and I’m loving the fact that we have an overhead light in here now. I plan on getting one or two lamps as well but having this guy is a total game changer. It’s controlled by remote so we didn’t have to deal with having the switch re-wired for the fan/light combo (it’s wired for one of the outlets right now). 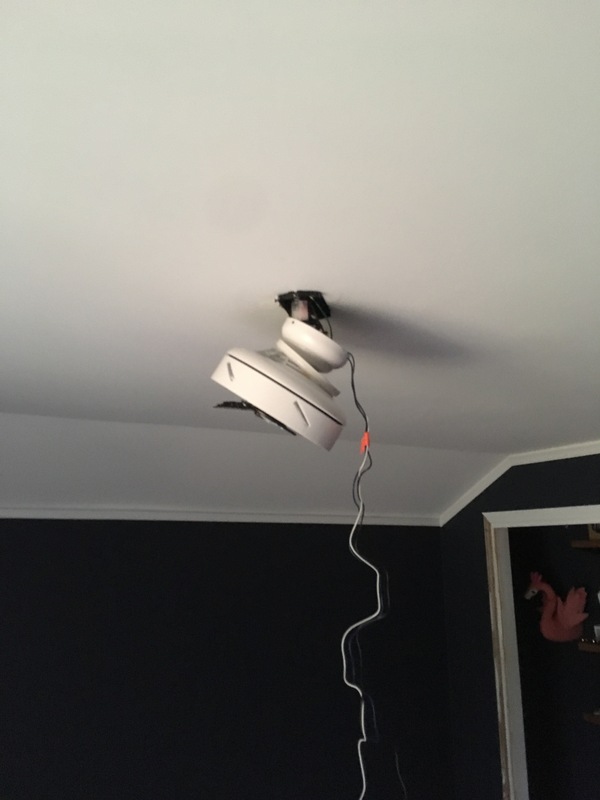 They also designed it to where the fan supports itself while it’s being wired which means I didn’t have to stand in the middle of the room holding a heavy fixture over my head while Kyle dealt with getting all of the connections hooked together like usual. So thanks, Home Decorators Collection at Home Depot. You’re the real MVP. The biggest difference in the room is obviously the new floors. We’re in the process of slowly putting this laminate down in most of the house and I love it. 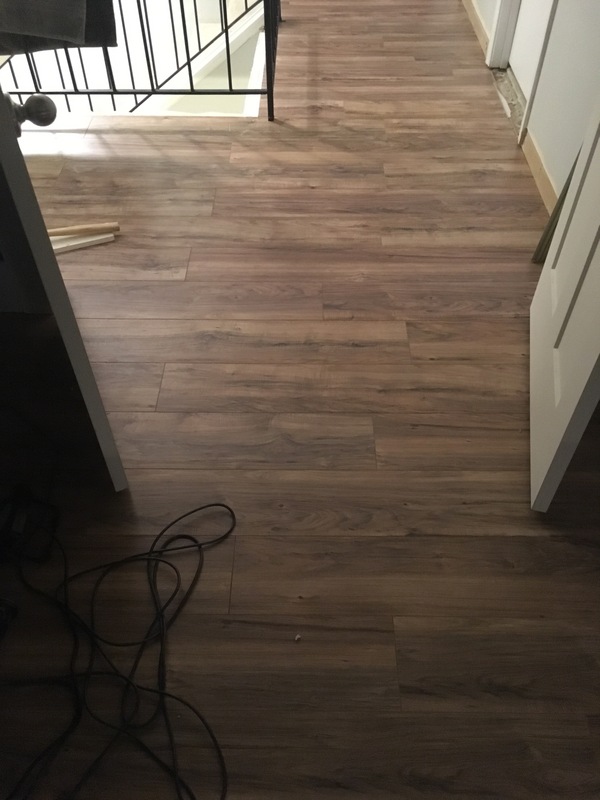 Originally we had planned on hardwood throughout the house but these are so low maintenance and they’re pretty scratch resistant which is huge for us with two 60lb dogs that love to run and wrestle inside. We also decided to upgrade the baseboards in here to these 7″ beauties to match the ones we recently put in our master bedroom. Eventually these will go throughout the whole house, too. That random furniture will be moved eventually but our house is kind of a disaster area right now and there’s no place for it to go. I have to stop for a minute and say that I am so freaking thankful for Kyle. I tried to pull my weight as much as I could but I get tired a lot easier these days and my knees and back start hurting pretty quickly so I tend to take more breaks. Kyle painted the ceiling, pulled all of the staples from the floor, changed out the fan, and cut and installed all of the baseboards and other trim. He also did all of the flooring cuts which was a major help and didn’t complain when we had to make 2 Home Depot trips over the weekend. I pulled up most of the carpet tack strips, re-painted the crib wall, laid the underlayment and installed most of the new floors but if it was just me, I probably wouldn’t have gotten anywhere close to this much done. Anyway, other than all of the physical progress we made I also went on a little shopping spree and ordered some of the stuff I’ll need for the finished space. 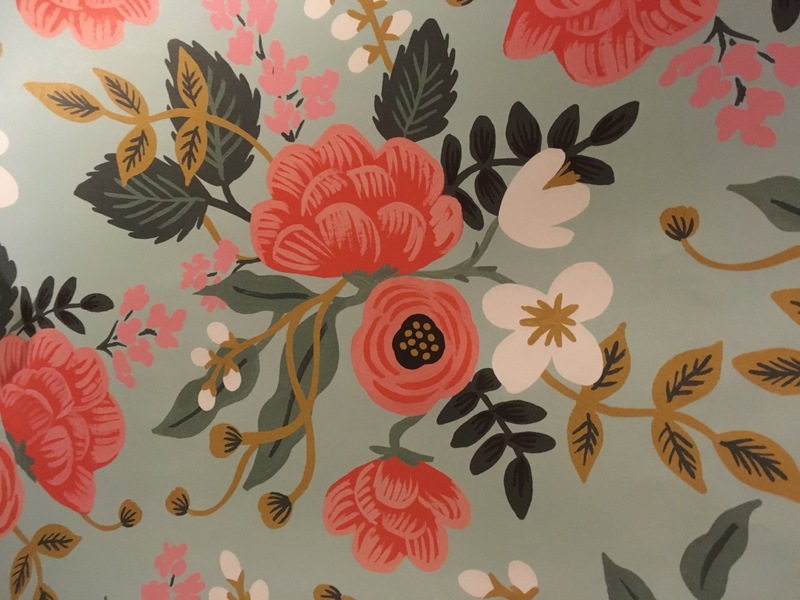 The flamingo art prints, glider, rug, and new closet doors are all on their way (or already here) but the closet doors and art prints have a tentative delivery date that’s dangerously close to the big reveal so I’m keeping my fingers crossed they get here on time or sooner! The glider got here pretty quickly and I’m super excited to have a chair to take my breaks in instead of sitting on a pillow on the floor or retreating to the couch in our bedroom where I usually get taken hostage by at least one cat. If we can get all of those things done, we’ll be in pretty good shape as far as the big projects go. I’ll still need to figure out if I want to do white or stained shelves for the reading nook and build those but other than that it’s really just putting everything together. Oh, and figuring out how we want the closet to function…kind of forgot about that. I also forgot that we have family staying with us for a night next week and the guest room is a nightmare so a big chunk of our weekend will be taken up by clearing it out and finishing the floors in there (it’s still mostly carpet minus a 3ft strip of laminate)! Make sure to check back next week to see if we stuck to the plan and check out the other guest participants for the ORC here! Well you guys, we must be completely crazy because we decided at the last minute to join in as guest participants for the Fall edition of the One Room Challenge. 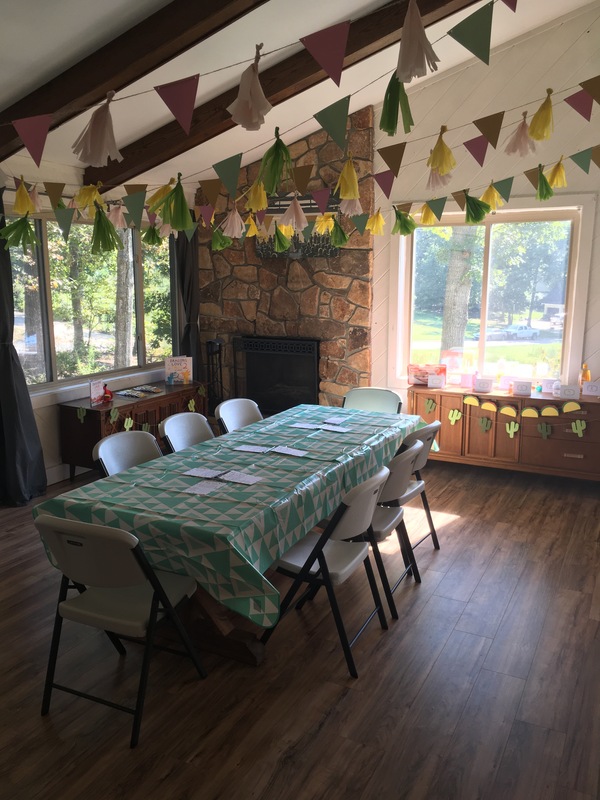 The One Room Challenge is hosted by Linda at Calling it Home and it comes along twice a year. During the ORC, featured designers and guest participants choose one room to makeover in a six week time frame and share their progress every week. I’m sure those of you that know us are either laughing hysterically or silently screaming because I don’t think we’ve ever finished a project in 6 weeks. It’s okay, I’m laughing/screaming/sobbing uncontrollably right along with you. But you guys, I just couldn’t resist the timing on this one! What better way to force progress on the nursery than declaring publicly that it’ll be done in six weeks? Right? Maybe? Okay, don’t answer that. I’m not sure I ever blogged about it but we turned it into a joint office/craft room/guest room for a while but I don’t think I have any pictures of that phase. Y’all, I just started freaking out a little while putting that list together so this should be interesting. The good news is, we have everything we need to make progress on the floors this weekend! I’ll be posting our progress every Thursday so be sure to check back for regular updates and if you’re interested, head on over to the link up page to see the other guest participants! 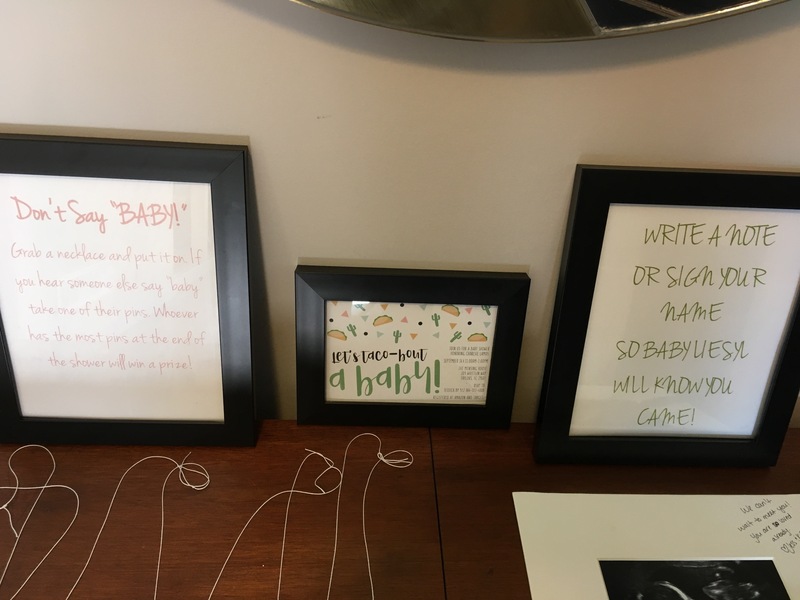 A couple of weekends ago I threw a baby shower for one of my work BFFs, Cha. I wanted to do something fun so I decided to take her favorite food and use it as the shower theme. 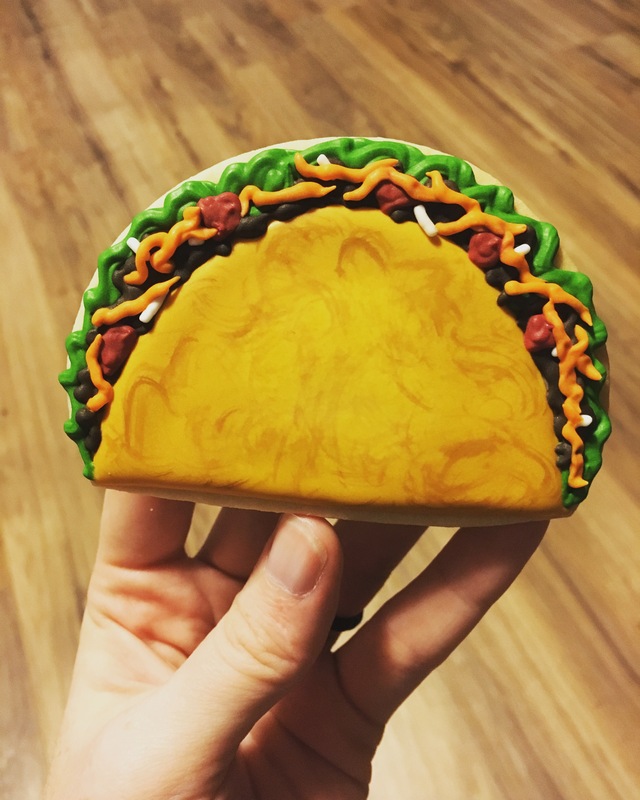 So yes, I threw a taco themed baby shower and it was awesome. 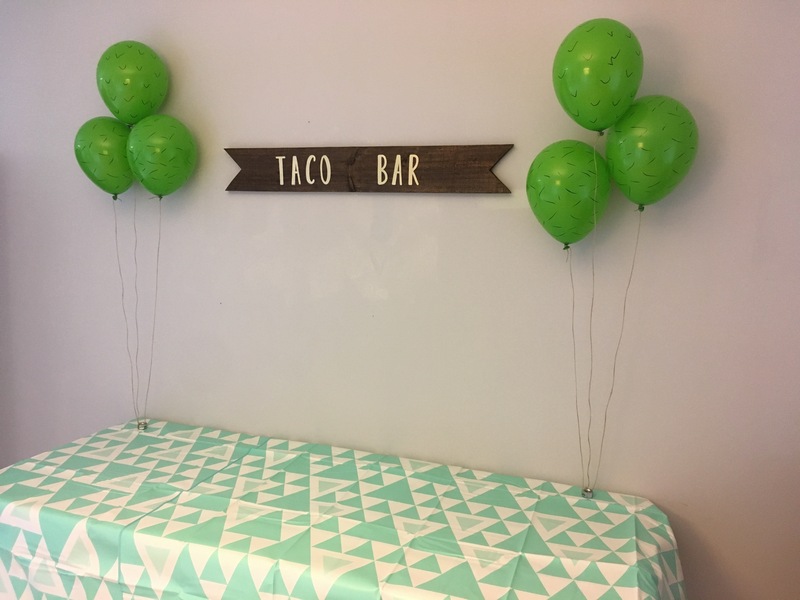 I did a mixture of purchased and DIY party decor and while I originally planned on having Chipotle cater, I ended up putting together a taco bar with lots of help from Kyle and a couple of friends that came early to help out. 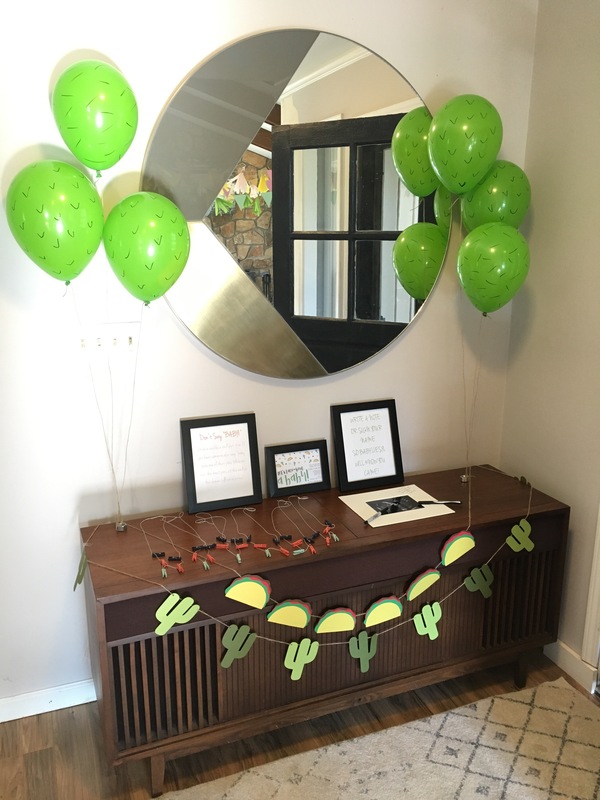 The week before the shower, I strung a bunch of banners together with a mixture of paper triangles and cacti that I ordered and tissue poms and tacos that I made myself. 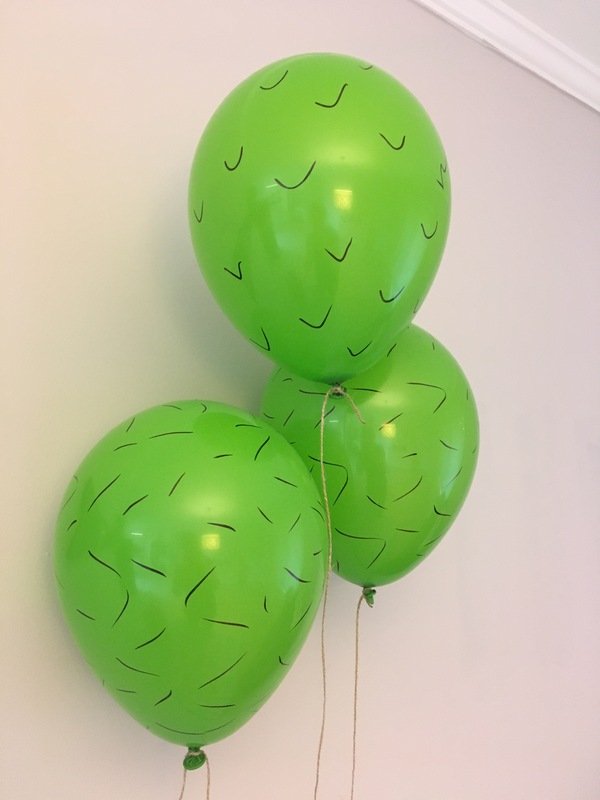 I also blew up some green balloons that I made to look like cacti the morning of the shower and at some point I grabbed some geometric tablecloths from Lidl which I discovered are vinyl which means I get to reuse them! Huzzah! Fun fact: the balloons that came with the helium tank I bought were terrible. I had planned on doing a mixture of dark and light green balloons but all of the dark green balloons except one popped in my hands which was no less terrifying the fourth time as it was the first. Those stupid balloons almost had me in tears the morning of the shower. We did a taco bar for lunch and a churro bar for dessert; both of which I forgot to take pictures of once they were actually set up. For the tacos, we had shredded chicken and beef which were in crock pots and then all of the toppings: rice, black beans, rotel, avocado, jalapenos, bell pepper, cheese, sour cream, and guacamole. Kyle picked up churros from Costco the morning of and I cut them into quarters to make mini churros. I also put out crushed pecans and walnuts and three different dipping sauces in case anyone wanted to get fancy with their churros (chocolate ganache, caramel, and cinnamon honey butter). I made the ganache and the cinnamon honey butter but the caramel was store bought. Here’s a picture of the food table before any food actually made its way over to it. The taco bar sign is a scrap piece of wood that Kyle cut to look like a banner and stained a couple of nights before the shower. I bought gold stick on letters from Hobby Lobby to save time instead of trying to hand letter because ain’t nobody got time for that especially when it’s a last minute idea that I decide I can’t live without. 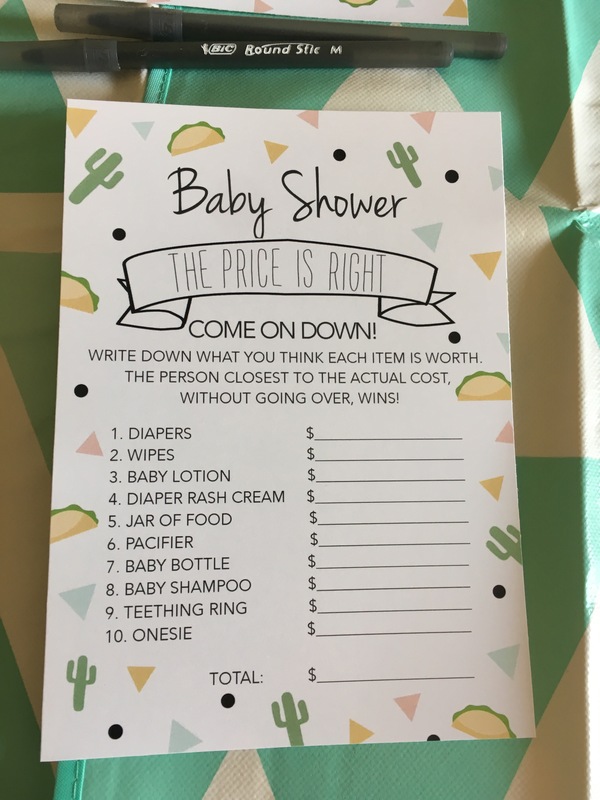 I didn’t want to do a ton of super involved shower games so I settled on the clothespin game and a round of Price is Right: Baby Shower Edition. For those of you who are unfamiliar, when you play the clothespin game you start out with a certain number of pins and if you say the word “baby” and someone catches you, they get to take a pin. Whoever ends up with the most pins wins. I ended up with no pins. I am not good at the clothespin game. Kyle (the best husband in the world whose help I greatly appreciated) took the invitation design (which I ordered from another etsy shop) and turned it into custom game cards for me which I had printed at FedEx the day before the shower. After eating, playing the Price is Right, and opening gifts we all just hung around. As people left, I made sure that they had signed the guest book and picked up their favors. For the guest book, I decided to use one of their ultrasound photos and put it in a pre-matted frame. I popped the mat out so everyone who came could write their well wishes to the baby and parents to be. The favors were custom sugar cookies made by The Chocolate Moose, which is a super awesome local bakery. Overall, I think the shower was a success and now I have lots of party decor that I can break out in the future. Olè! Since I missed Friday Five again, I figured I’d do a weekend recap. Friday was insane and I just didn’t have any time to post and I was going to post yesterday but I ended up on the couch all day from exhaustion and just a general bleh feeling. I swear I need another weekend to recover from my weekend. Anyway. Let’s get to it. I’m going to do a separate post about the shower because I really liked how it turned out so that should be up in a couple of days. I took the afternoon off from work Friday to run some last minute errands for my friend Cha’s baby shower and to get some cleaning/decorating done. 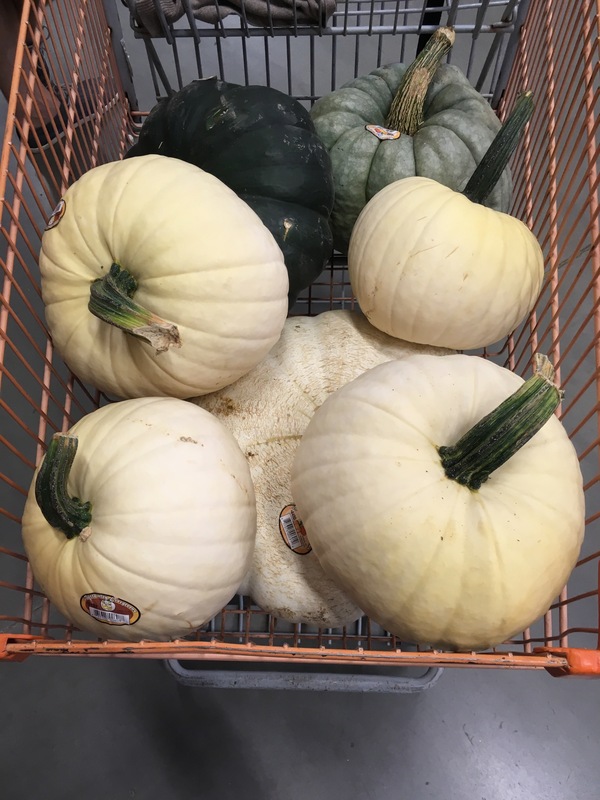 Side note: Publix has their pumpkins out now and it took all the strength I had not to buy a cart full to start decorating our porch. This weekend all bets are off though since Friday is the first official day of fall. I don’t care if it’s still 90 degrees next week, pumpkins and mums are definitely happening. 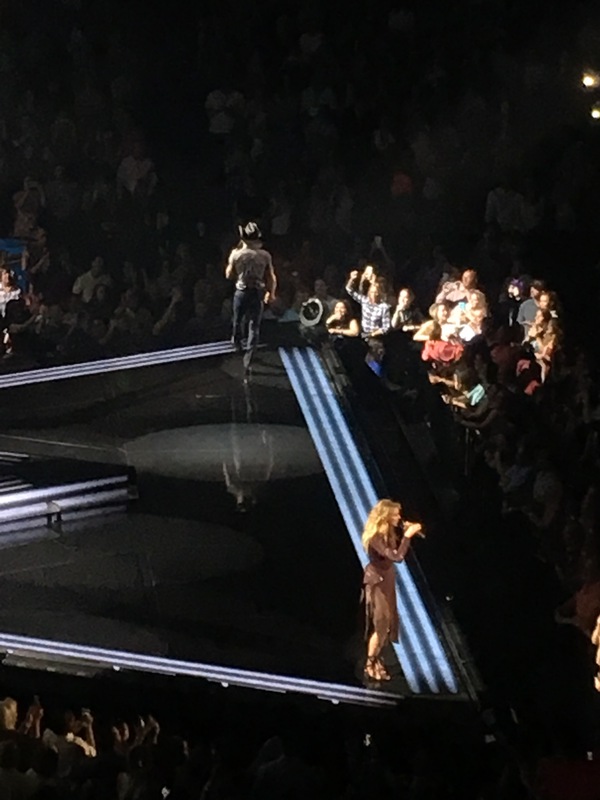 Friday night Kyle and I went to the Tim McGraw and Faith Hill concert with my friend Jackie. Country is one of my favorite genres and when I saw that Tim and Faith were coming to our town, I pretty much immediately bought tickets. 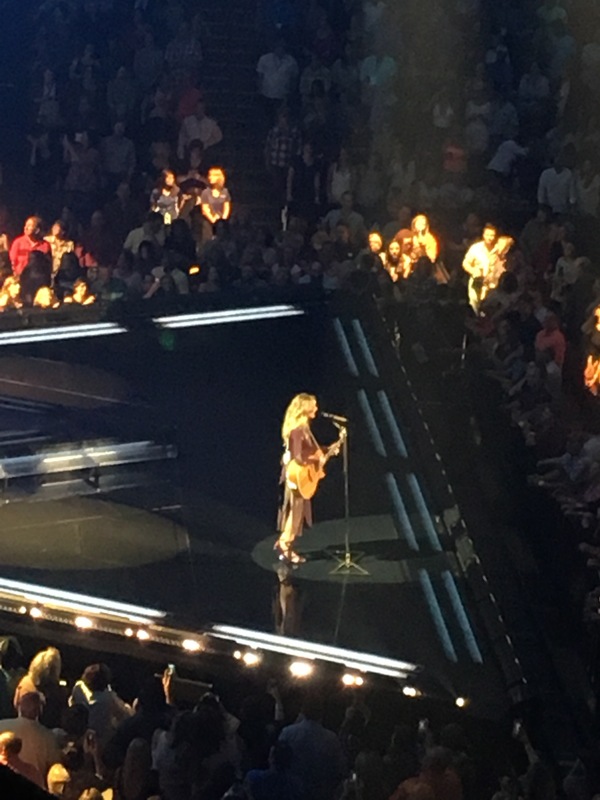 We were in the upper bowl but we looked down directly onto the stage and we sat above the stairs so nobody was in front of us which made for a killer view for the most part. The concert was good overall but I thought the Eric Church concert we went to a couple of months ago was better. We only stayed for about half, most of which was Faith Hill but I was tired and didn’t want to be out too late since I was planning on getting up early the next morning. Saturday morning I was up bright and early to drop the dogs off at camp and finish cleaning/decorating for the shower. Kyle was a big help with all of the cleaning and food prep and he was nice enough to run out to pick up a couple of things before babysitting my BFF’s toddler during the shower. The shower went on until around 2 and then our super amazing friends helped us clean up after which was a big help. After everyone left we loaded up the car and headed on to our last event of the weekend. 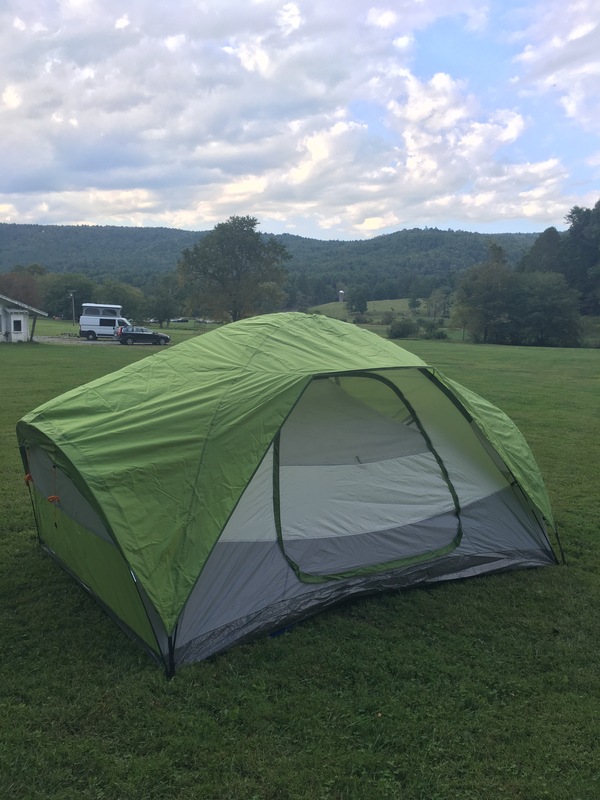 Kyle’s company put together this overnight camping trip at Oskar Blue’s REEB Ranch in Hendersonville which had some amazing views and is only a little over an hour from our house. It wasn’t the most fun I’ve ever had on a camping trip but it came after a very long, busy week and I was exhausted. It was the first time I was meeting any of his co-workers and it was just a lot to take in all at once so I was pretty overwhelmed. Sleeping was kind of impossible because I couldn’t get comfortable and I seriously miss the days where I could sleep on my stomach and I was just grouchy. Everyone was really nice and had it been the only thing we did that weekend I probably would have felt completely different about it but I really just wanted to be home in my bed at that point. I had planned on trying to be at least semi-productive when we got home on Sunday but I was insanely tired and I ended up getting sick on the drive back down to the house so I spent the rest of the day on the sofa until it was time to pick up the dogs and I think I ended up going to be around 8 that night. So that was our insane weekend and I don’t plan on being that busy any time soon. It really doesn’t sound like that much when I write it here but I promise you it was non-stop. 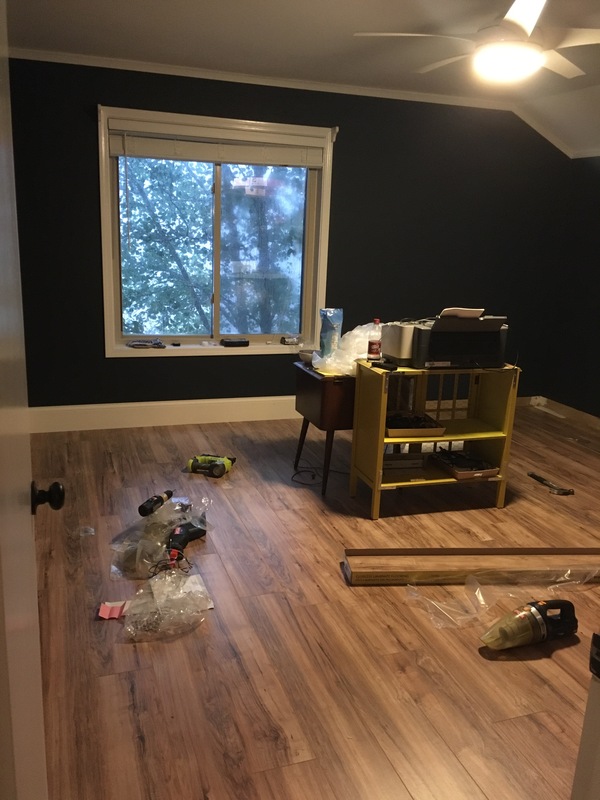 Our plan this weekend is to decorate for fall, finish up the painting in our bedroom, and start ripping up carpet in the hallway to prep for new floors so hopefully soon I’ll have an actual master bedroom update for you. Yes, I know today is Monday but I lost half of my Friday to a headache so let’s just all pretend, okay? Cool. 1 – In what is shocking to no one, we have made no house progress recently. It’s a good thing I don’t have a home improvement blog. OH WAIT. Seriously though, we’ve been so busy outside the house and I’ve been swamped at work so when I’m home I really just want to sit and watch old episodes of Chopped on Hulu while I eat copious amounts of Palmetto Cheese and drink Capri Sun. We did finally get the old sectional into the garage, Kyle did some yard clean up yesterday, and we’re calling ReStore soon to come pick up a few things we want to donate. This weekend is completely out but I don’t think we have a lot going on the rest of September or October so our plan is to buckle down then. 2 – We went on vacation a couple of weeks ago and it was much needed! Instead of a cruise we decided to go up to visit Kyle’s family in Massachusetts and spend most of the week relaxing by the pool. Even though I still managed to do some work while we were up there, the trip was so good for our mental health. Plus, the weather was gorgeous and it got us so psyched for Fall! 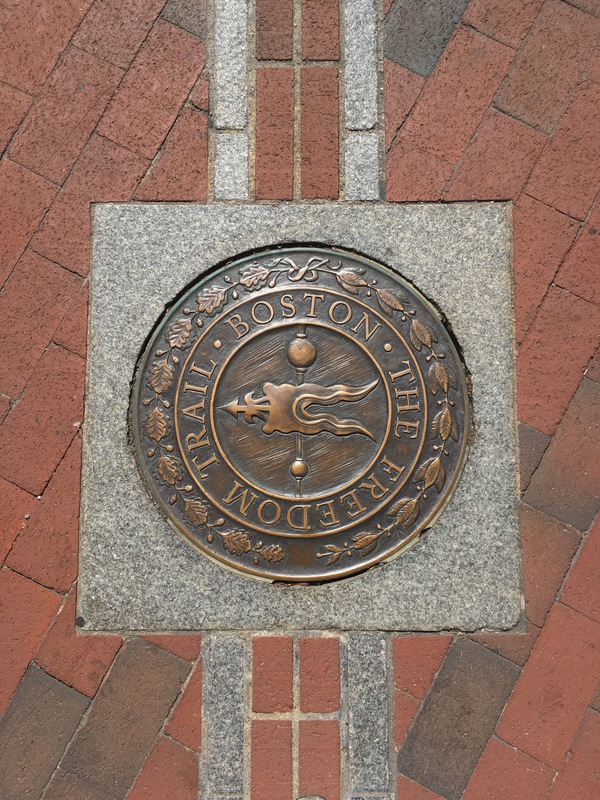 3 – While we were in Massachusetts, we made a day trip to Boston and it was my first time really seeing the city. 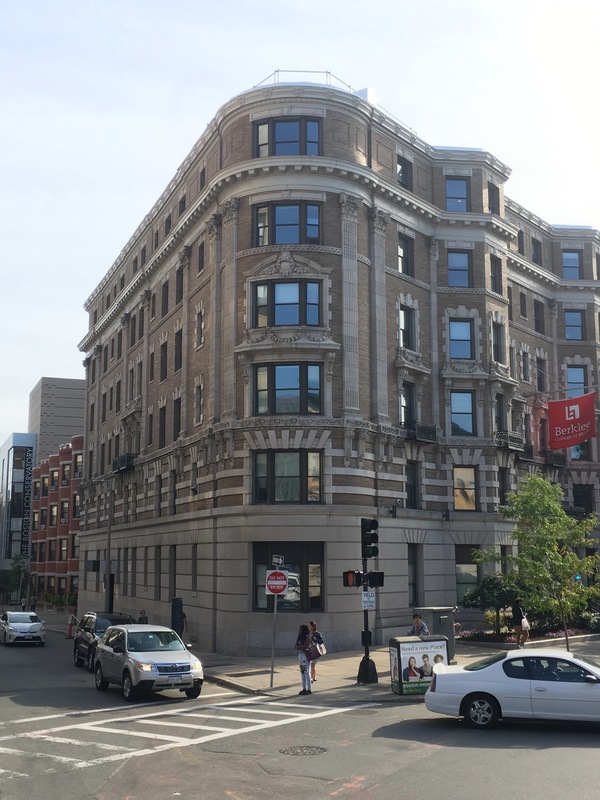 I’ve flow in and out of Logan a couple of times and I went to a Red Sox game at Fenway several years ago but this time I got to walk around the city a bit. 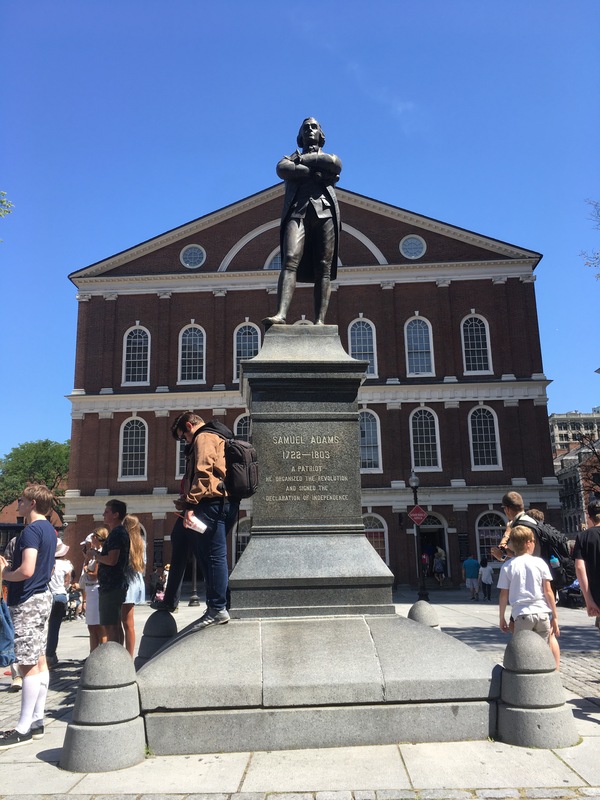 We decided to do a hop on/hop off trolley tour so I wouldn’t have to spend too much time on my feet and it was such a great way to see the city! 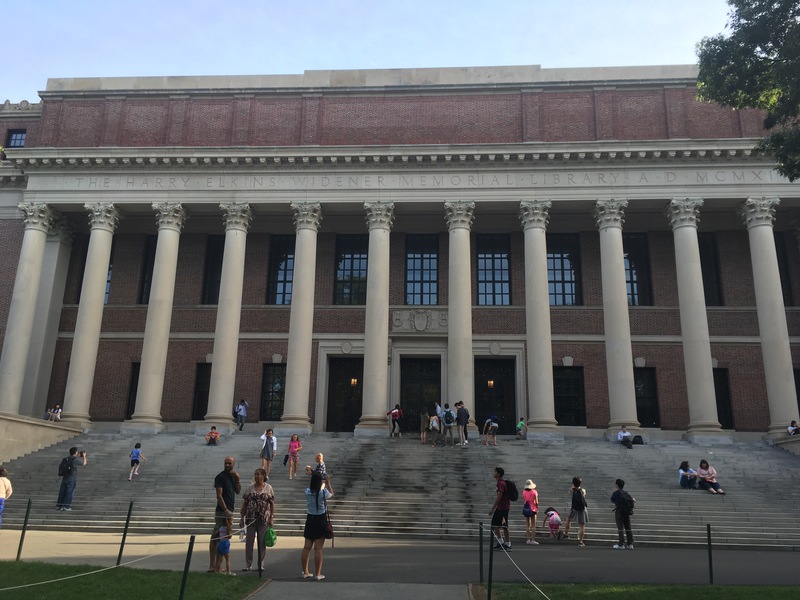 We ran out of time to go to some of the more historic spots but we did get to see Harvard’s campus which is something I’ve always wanted to do and it did not disappoint! 4 – We tried out a new-ish burger place over the weekend called LTO Burger Bar. I’ve been kind of anti-burger lately but this place was really good. All of the burgers are double patty which I don’t love but I just took off one and gave it to Kyle. I was too hungry to take a picture of my burger but it had sloppy joe chili and an onion ring on it. They also have a small selection of insane milkshakes. 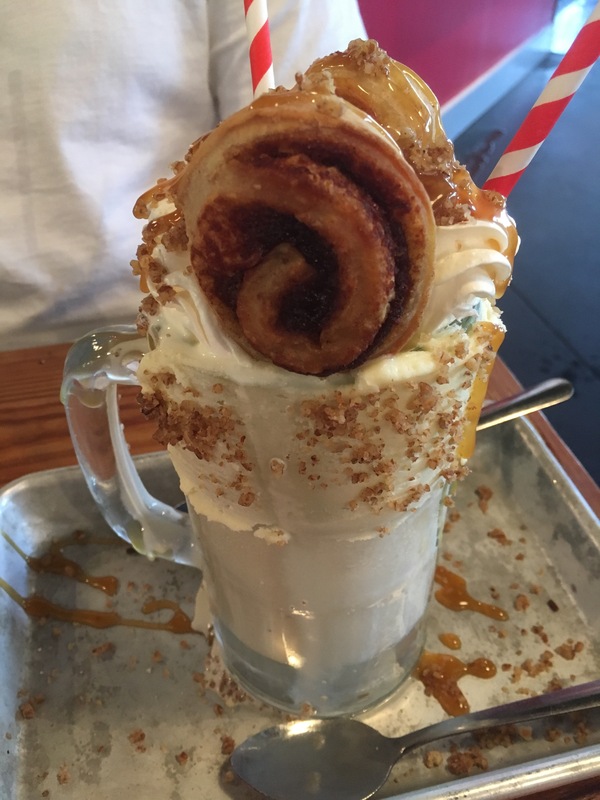 Kyle and I split one called the Cinnamon Roller Girl and it was topped with warm cinnamon rolls, caramel, and spicy pecans and the glass was rimmed with cinnamon roll icing and it might be one of my favorite milkshakes ever. 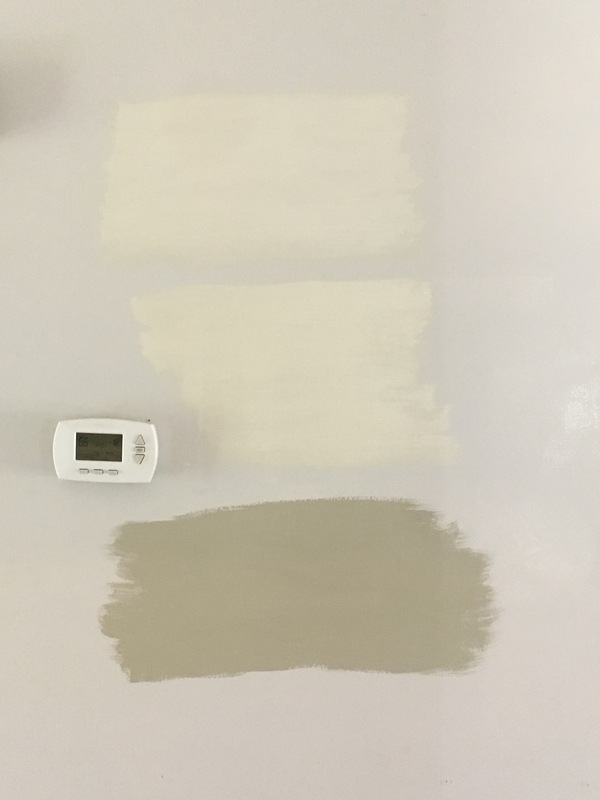 5 – We are still on the hunt for the perfect grey color for our house. We tried out five samples this weekend but I think I’m going to have to prime the wall and try out larger sections to really get a better idea of how they look. There are only 3 of the 5 that we tried out in this picture but it’s so difficult to see what the top two really look like. Kyle likes the bottom one but I’m afraid it might be too dark for our house (more so upstairs than downstairs). It probably wasn’t the smartest decision to test them on this wall since I’m hosting a baby shower this weekend…whoops. I’ll just have to hang something to cover them for now and act like it doesn’t look weirdly placed. This week/weekend is going to be so busy so I’ll probably spend the next week recovering but after that, it’s game on with the house projects. Probably. So I mentioned a while back that we were changing our plans for the rest of 2017 a little bit and that’s 100% to make room for the nursery. I didn’t really go into detail about what that meant but basically we’re going to be changing the function of several rooms and moving a bunch of stuff around. Before we start working on the nursery there are other rooms that need attention first. Master Bedroom. I’m only mentioning this room because it’s still not finished and for my own sanity it needs to be done before we do anything else. Study/Sitting Room > Family Room. This is the room between the kitchen and the living room. I’ve mentioned it before, but we aren’t doing anything major in this room this year. We are, however, changing the function and making it the TV/family room. Eventually there will be built ins and new trim and *fingers crossed* maybe even opening up the room into the kitchen the tiniest bit more (where the Miles Davis poster is in the above photo). We’ve already moved our old sectional in there as well as the electric fireplace from our bedroom and our TV but I haven’t taken any new pictures. 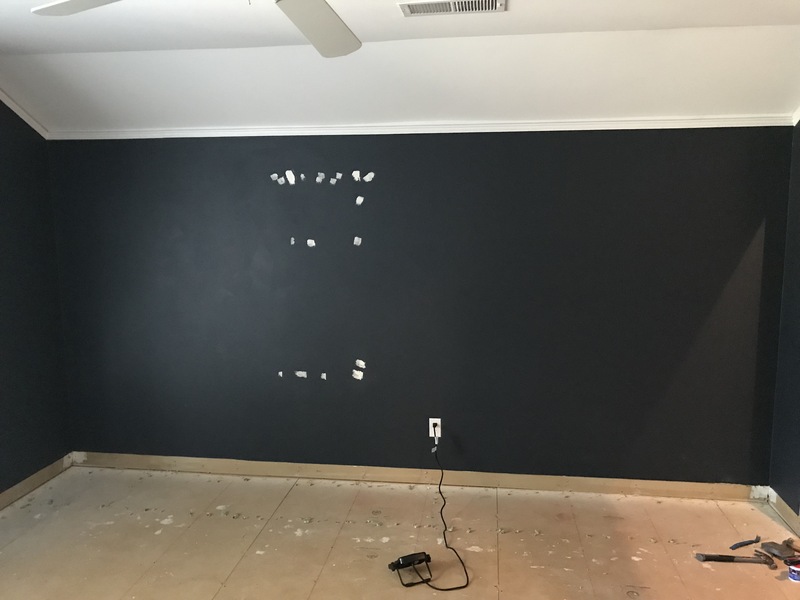 The only other thing we plan on doing this year is re-painting (once I find a gray I actually like…story of my life), installing blinds, and replacing the current sectional with a new one. The old sectional is about 5 years old, smells like everything a dog might smell like, and is currently being partially propped up with a 2×4 because the frame on the chaise broke. The plan is to get this sectional from IKEA. It should still offer plenty of seating and is a good piece for us for now. I realize we’re almost 30 and a lot of people think that means you should buy your furniture from somewhere that’s not IKEA but honestly, we have 2 dogs that have decided it’s perfectly acceptable to pee on everything and use the sofa as their jungle gym and we’re about to add a baby to that so whatever. *Shrug* My dream sectional is almost 4x the price and I think I would end up on Snapped if we bought it and it was immediately destroyed. Living Room > Office/Craft Room. I’ve always kind of struggled with this room as the living room because the furniture placement is tricky with a TV. It’s much bigger than the other room but I don’t actually mind a smaller room for TV watching. It’s cozier. The large space is perfect to use as a multipurpose room. We’re losing Kyle’s room upstairs (to become the guest room) and my former craft room (to become the nursery) and we’d both like a space with work from home capability, so we’re combining spaces and moving downstairs. One half of the room will house our shared desk, lots of storage, and eventually a couple of club chairs comfy enough for lounging/reading. The other end of the room (by the fireplace) will be set up with a small table and chairs for crafting, putting together puzzles, and one day doing homework. We may also work in a play area in here but I have a feeling the family room will double as a playroom. It’ll be a long time until this room is finished the way I want it but we’ve already moved the desk down so that’s a start! Kyle’s Office > Guest Room. I honestly don’t even know if I’ve ever posted pictures of this room and I don’t even have a listing photo of it to show you. Whoops. When we moved in, we turned one of the bedrooms into an office/music space for Kyle. I had planned on keeping it as is, but Kyle suggested we turn it into a guest room instead so that’s what we’re doing. It will most likely still double as his music space because we don’t have guests super often (but we have started getting them often enough to warrant a guest room). When we bought our new bed, we moved the old one into my craft room so once we clear everything out, we’ll just slide it across the hall and the room will be ready to go. 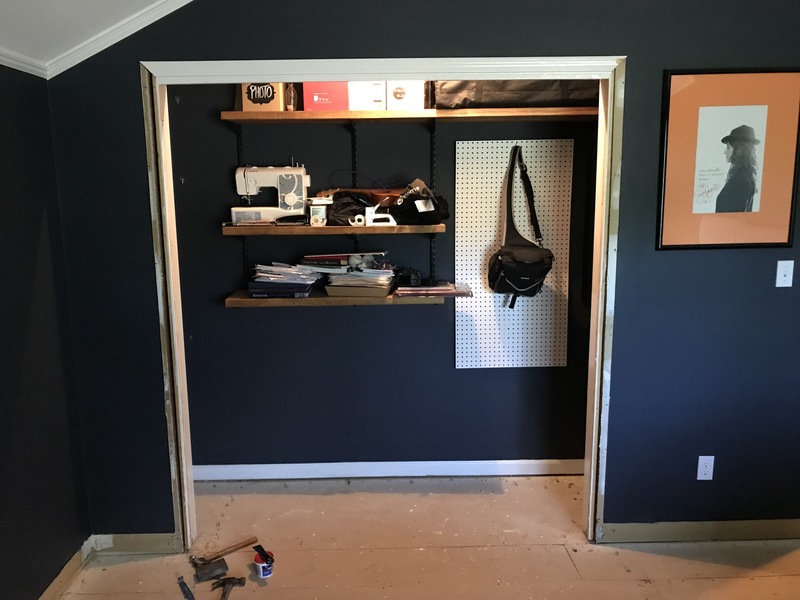 We need to put doors back on the closet (we tossed all of the old crappy bi-fold doors) and we plan on running the laminate from our bedroom all the way down the hall into this room and the nursery. Upstairs Floors. 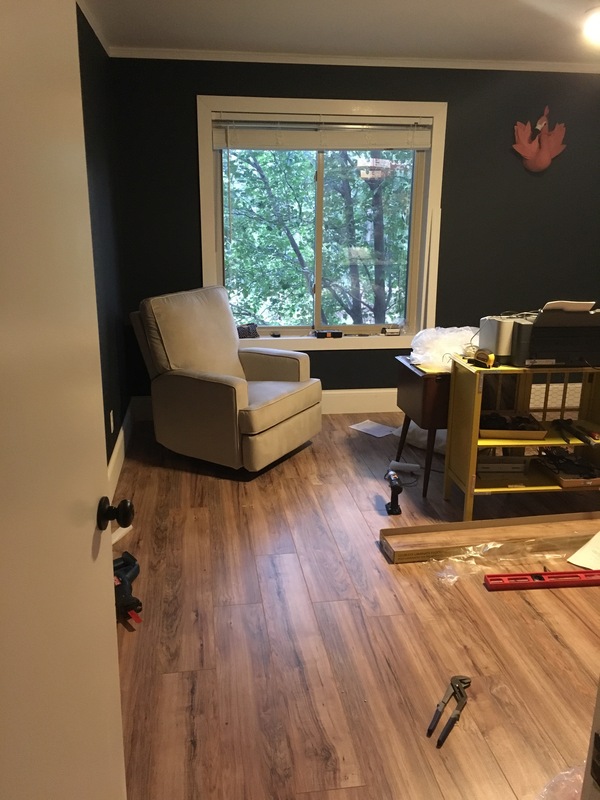 I just mentioned that we’ll be running the laminate all the way down the hall into the nursery and future guest room but since it’s probably the biggest project, I figured it deserved its own section. Luckily, the flooring is super easy to install so the worst part should be pulling the old carpet out and prying up a billion tack strips and staples. Master Bathroom. All I want to do is finish demo and put down new subfloor so we are completely done with the old, gross, water-damaged floor. There’s no point in building it all back up right now but I’ll feel better about this room when demo is done and all of the debris is cleaned out. Foyer. Mostly I just want to skim coat the wall where I tried (and failed) to remove wall paper and re-paint with a new, not purple gray. Deck: Phase II. This would be major so it’s not likely but I’d love to finish the second phase of the deck. We’re planning on measuring it out and pricing out materials this weekend and then we’ll go from there. Kyle would probably have to do most of the heavy lifting on this project but I could at least hammer in joist hangers and screw in deck boards. Linen Closet. Super low priority but if we don’t completely redo it, we should at least fix the broken doors. Now let’s see how much we actually get done. There are so many things that need to be done before we actually start any work on the nursery (like oh I don’t know, finally finishing our bedroom) but we have decided on a theme and we’ve started to pick out/purchase a few nursery items. So first thing’s first, we found out at a recent elective ultrasound that we are having a girl! They’ll confirm in a few weeks at my next scan but we went at 16 weeks which should be accurate. I had no idea going into it but I am still kind of in shock. I grew up in a house full of boys and all of my cousins are boys and I’m just much better at dealing with boys so I feel like a boy would be more in my comfort zone but I am so freaking excited to be having a girl (and would have been either way)! We’re also pretty excited about our nursery theme: floral flamingo. Flamingos are kind of a big thing with us and even though we debated several other nursery themes (fairytales, monsters, Harry Potter), I think the flamingo theme was also kind of a front runner. The plan is to mix in some floral patterns and maybe a pineapple or two for good measure. The former craft room/current guest room is going to be cleared out to make way for the nursery. We’re keeping the walls Hale Navy (that’s that blue dot above) and we’re planning on tearing out the carpet and replacing it with the same laminate we put downstairs. I need to find a rug but I can’t decide how bold I want to go with it. I also can’t decide if I want a gray glider or beige (pictured above). I’m thinking since the walls are so dark and some of the furniture is going to be dark/heavy I should go with beige but I also think gray might hide stains better. Meh. I have time to figure it out. We were going to get a white dresser from IKEA to use as a changing table but then I saw this dresser at a local vintage furniture shop and fell in love. I want to change out the drawers pulls and stain it a little darker but it has a ton of storage (there are more drawers inside the cabinets!) and I love the lines. I love how the pink and navy look together! There are a lot of other rooms that need our attention first before any real work starts in here but I’m really excited to have a plan in place. We’ve already started cleaning out/rearranging other rooms in the house in preparation and I promise we have made progress in our bedroom, I just haven’t really shared it yet. 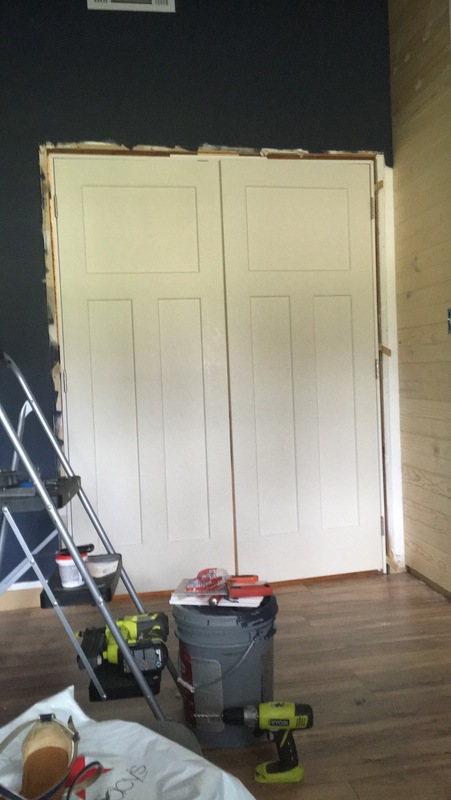 The last big thing we need to do right now is paint the shiplap and the new doors which hopefully will get done this weekend! It’s too hot to exist right now and I’m ready for Fall (yes, I’m one of those people). I’ve never been a huge summer person and I’m a baby about the heat. All I want to do right now is crank the air down real low and never leave my house but there’s that whole work thing I have to go to so I’ll have to settle for keeping my desktop fan turned all the way up and pointed directly at my face. 1 – In case you missed the announcement over on Instagram, Kyle and I are having a baby! Well, I guess I’m the one that’s having it but he’s pretty involved in the whole process, too. I just hit 15 weeks today and we’re do mid-January and we’re both very excited about the whole thing. I don’t know how much baby related stuff I’ll post on the blog outside of the nursery, but it probably won’t be much. 2 – Our garden is exploding and I love it. I’m nervous about losing some of the plants because it’s been so hot lately but we’ll see. Our jalapeno and tomato plants have been producing like crazy and I think our bell peppers might be ready; hopefully we haven’t missed them! It’s been a few days since we checked on them and they were close. 3 – I posted forever ago about a mirror I was in love with and although I thought we would never actually buy it because spending that much money on a mirror makes me want to hurl, it showed up at our house a few days ago. Yep, we actually pulled the trigger on it. West Elm was having a 25% off sale and Kyle’s parents very generously offered to gift us half (thanks again!!) so while it was still more money than I every thought I would spend on a piece of decor, I’m very happy with the purchase. We’re hanging it this weekend and until then it’s safely sitting in the former craft room/current guest room/future nursery. 4 – Kyle and I tried out a new diner downtown this morning and holy crap it was good. Seriously, if you are local you should check out Diner 24. I had heard mixed things but our service was pretty good and the food was delicious. The best part is it’s open 24/7 so if we ever find ourselves out partying downtown at 2am (hahahaha, yeah right) we can easily go throw down on some dinner plate sized pancakes. 5 – We still haven’t really worked on the bedroom (other than installing the new door frame/doors with help from Kyle’s dad) but Kyle and his dad knocked out part of the fence that still needed to be done and we got a new roof! We also moved our sectional and tv into the sitting room so now the other room is open to become the office/craft room. So the bedroom might not be done yet, there has been a little bit of progress going on around the house.